We had an unseasonably warm winter this year. No real snow until January, really. However, we were pounded with snow for Valentines’ day, and more recently, St. Patrick’s Day (well, technically the day before, but same difference). The snow is still melting, but we are ready for Spring. Well, you recall what being snowed-in means, right? Comfort food! Cati and I made crepes that morning. It’s a simple and delicious recipe; we use one of those little hand-blenders to mix. This quantity of batter makes ~8-9 crepes. Heat a big Teflon frying pan (9“ or bigger) on the stove and heat to med-high. Add a pat of butter to the pan (don’t burn the butter) and pour a ladle of batter into the pan. Cook the crepes until they golden, flip once, then stack on a plate. The key to good crepes is to have the right filling(s). Some typical fillings we use are Nutella, granulated sugar (with lemon), marmalade, or smucker’s fudge topping. You’d better make plans to go for a jog or break stones at the quarry after a breakfast like this; it’s not exactly Grape-Nuts and skim-milk, y’know. We only eat like this when it snows (note: it’s always snowing somewhere). For more on our St. Patrick’s day activities, check out G’s website. We all went (clad in green) to The Parting Glass in Saratoga Springs. It’s a sort of St. Patty’s Day landmark (as you’ll see from the crowds). Gabe and I drank a keg each, ok not really, but that explains the last photo in his post. We had the kind with the special little machine. It was definitely a very hearty meal, and I can see how it would be “just right” after many hours of exhausting skiing or snowshoeing as it is very heavy. I think I had about four slices of the melted cheese with potatoes, pickles, roasted mushrooms, and onions. I had to waddle to the car. It was a great time, and I have some photos below of the contraption we used to melt our cheese and roast our veggies. So it was a great little party, and I learned a new dish. We would melt the slices of cheese in a little pan and then pour/scrape the freshly melted cheese onto our plates of vegetables. It was very good, especially if you like cheese as much as we do. Open one of the cans of chick peas and pour out all liquid into sink. Add the chick peas to the blender. Add the other can to the blender as well, but this time with all the liquid. Peel then cut the garlic clove in half, long way, and pop out the little center stalk from the middle of each clove (y’know, the little part that sprouts when garlic sits around too long). Doing this will make the garlic less potent, but still plenty flavorful. This seems to make it a little easier to digest too; maybe it’s just a function of it being less strong [shrug]. Add the oil, juice from 1/2 of the lemon, salt, and tahini to the blender and blend. The hummus will be thick and you may have to use a spoon to move the hummus at the top of the blender. Try to make a vortex in the blender so your hummus will be nice and smooth. Just don’t drop the spoon in the blender while it’s running, uh, not that I have ever done that. Pour/spoon hummus into a large shallow bowl or Tupperware, and chill in the fridge for at least a few hours. When you are ready to serve, sprinkle paprika on the top, and if you really want to be fancy drizzle some more olive oil and lemon on top too, then serve. *There is a good hummus in the grocery store, but it’s usually in the dairy section. The name of the brand is Sabra Salads. I’d be surprised if you could buy the other stuff after you try Sabra Salad’s hummus. As good as it is, I still like to make my own. Ok, it was bound to happen sooner or later; a post about Saso’s. All our friends have had to endure, at one point or another, our gushing about this terrific gem of a restaurant. Saso’s is one of the best things Albany has going for it (assuming you are a fan of good sushi). Cati and I have been going (pretty much monthly) for years, and the place is incredible. What makes it so good? Saso. His dedication to his craft is remarkable. The guy seems a little obsessed about what he does (in a good way). There is a constantly changing “specials menu” and he is a meticulous quality fanatic. For evidence to support my claim, all you have to do is go there. You’ll find Saso-san behind the sushi bar, preparing (or at least inspecting and plating) every piece of sushi that is ordered. At times that might mean a longer wait when the restaurant is busy, but it is well worth it. Order some edamame and have a beer. His attention to detail is also demonstrated by the artwork on the walls. What looks like multicolor lithographs, are actually painstakingly carved sheets of paper that are laid over one another to create a complex landscape. They were done (and signed) by Saso-san himself, and each one took about one year to complete. The place is obviously HIS restaurant, and it seems to me that he feels responsible for the quality of the food his patrons receive. You won’t find some teenager reading off a list of ingredients while s/he makes the sushi (as we have actually seen at other sushi places in town). I hate to go off on a tangent here, but ever notice how lower end sushi restaurants’ and grocery stores’ sushi-counters exclusively employ young Asians at their sushi bars? Why is that? What makes a Chinese, Thai, or Vietnamese teenager, anymore knowledgeable than any other ethnicity when it comes to sushi? I think these places expect us to say, “Hmm, he looks Asian, he must be well-versed in a tradition which can be traced back to ancient Japan.” Gimme a break! That’s like expecting a red-haired American to know a good haggis recipe. Oh, and don’t even get me started on the little wooden boats either; I am convinced that’s the sushi equivalent to the Happy-Meal Box. Where was I? Oh yes, Saso-san. He is quite serious when he is working, and he is usually busy as hell whenever we are there (we usually do Friday or Saturday night). He obviously holds his kitchen and wait-staff to the same high standards. Which brings me to the next point. The staff. The servers are always courteous, attentive, and knowledgeable of the menu (especially Kris; the guy has every ingredient in every roll memorized). I often ask them for pointers if I am going to try something new, and they are always helpful. I’ve never had a bad server. If you’re lucky, Saso’s wife Kathy will be there greeting people and helping the wait staff. She is always pleasant, charming, and prompt and she really adds a nice touch to evening if/when she is there. The ambience. Saso’s is relatively small, and essentially one room. The decor is minimalist (you expected otherwise?) and elegant. We like the “one-room layout” for the lively feeling of a bustling eatery. We enjoy Jack’s Oyster House for the same reason. There is something energizing about a roomful of people enjoying themselves (and each other). Saso’s ambience is not particularly upscale, but that just indicates where the emphasis is; the food. Also, the unassuming storefront, in a not-so-great part of town, makes us feel like we are in on some great little secret every time we go. So that’s that. If you can go, and haven’t; go. The sushi is amazing. If you don’t like sushi, there are more items on the menu, like udon, tempura, teriyaki, etc. We know nothing about these things though. Cati and I keep telling ourselves we will try the noodles or some other menu items, but we like the sushi too much to miss it. 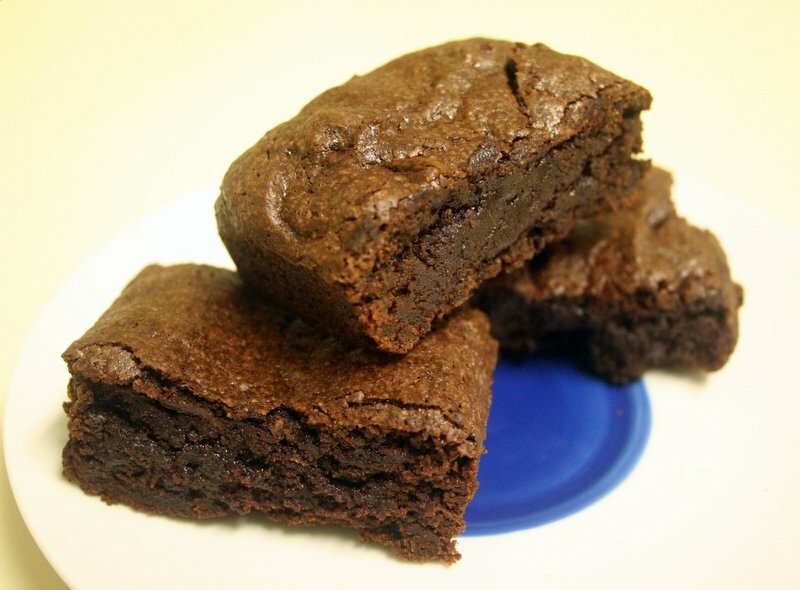 I was given a brownie recipe from our friend Nola; it’s great! I’ve made it twice now. I made it for relatively large groups of people so I doubled the recipe she gave me. Use a nine inch by 13” pan or cut the recipe in half and use and use an eight inch by eight inch pan. I am a baking neophyte and Nola was patient in dealing with all my questions. She also pointed out something I never bothered to think about; the importance of geometry in baking. The recipe she gave me was intended for an eight inch by eight inch pan, so if I wanted to double the recipe, what size pan should I use so I don’t have to change the cooking time? Ok, I know it’s not rocket science, but since I am doubling the volume of the mix, and I want to keep the cooking time the same, it’s the thickness of the brownie I want to keep the same. To do that I need a pan with double the area (8” x 8” = 64 sq.in. x 2 = 128 sq.in.). A 9” x 14” would have been nice (126 sq.in. ), but all I had was a 9”x13” and it worked just fine. I had to extend the cooking time a bit, but I just checked the brownies with a knife to make sure it was done in the center. Preheat the oven to 325F. Add butter and chocolate to a sauce pan or double boiler. I recommend the double-boiler to avoid burning the chocolate and butter. Also, you may want to slice the butter into 0.5” thick squares to facilitate melting; break up the chocolate too for the same reason before adding to the saucepan/double-boiler. While the butter and choc are melting, beat the eggs and set aside. After the butter and choc have melted, and have been mixed well with a spatula, remove from the heat, and mix in the sugar, then the egg (about one egg at a time), then the flour, salt, and vanilla extract. Fold the flour in a little at a time until the consistencey is nice, smooth, and homogenous; then add the walnuts and mix well. Lastly pour in the pan and bake for 30 min. No need to butter the pan, the brownies will come out after baking and cooling. Before removing the brownies from the oven, test them by poking the middle with a toothpick or knife to make sure they are done, and if so, remove and let cool for at least 30 min (if you can wait). Then cut into squares, remove with a thin spatula, and bust out the milk. Next time I make this I am going to substitute the walnuts with some toasted hazelnuts and call them Nutella brownies. We’ll see how that turns out. Cati and I often lament the dearth of decent Mexican food in Albany. El Mariachi II is fun to go to, but more for the charming bartenders and stiff drinks than the food. We usually get a plate of nachos or something when we go but that’s all. We tried the food at La Familia, and it was good, great even, but they have goofy hours (closed Fri and Sat nights) and the service is painfully slow. I plan to get their food again, I just have to crave Mexican food at 3PM on a Monday when they are open. Other places in town like El loco? meh. Garcia’s? feh. Pancho’s? eh. I think all those years in TX spoiled us. We used to go to dirt-cheap taquerias that had great food. But hey, Albany was founded by the Dutch, and apparently their influence lingers on the local palate. Cut the chicken breast into strips, sprinkle with adobo or taco seasoning and pan fry (fajita style). Sautee the onion and Portobello mushrooms adding salt to taste. Dina (Eddie’s wife) showed me a great trick for the beans. Open the can and pour off some of the sauce. Mash half the beans with a potato masher or a hand held food processor (like this). Add the unmashed beans to the mashed beans in a sauce pan and heat on the stove. This gives the beans a nice consistency so they’ll stay on your taco and not make a runny mess. Chop the tomatoes, cilantro, jalapeno, and onion into a Tupperware container. Add lime juice (mind the seeds) and salt to taste. Close and shake the Tupperware to mix the ingredients well. You can make your own with chopped onion, garlic, lemon, avocado, cilantro, and salt but we often by it in the produce section, premade. It’s decent, and way easier. Plus you’ve already sautéed chicken and mushrooms, chopped tomatoes and onion, mashed beans, and heated tortillas; isn’t that enough work? It’s sold refrigerated in the produce or dairy section; I forget the brand. Be careful, a lot of the ones called “dips” are pretty nasty; and they have dairy in them– what’s that about? 1 packet of soft wheat or corn tortillas (we prefer the whole-wheat kind). Heat them on a skillet before serving so they are nice, warm, and pliable. A good hot sauce (or two). We really like the McIlhenny Chipotle for its flavor, and the Habeñero for the kick. You’ll also want some sour ceam and a packet of shredded cheese.